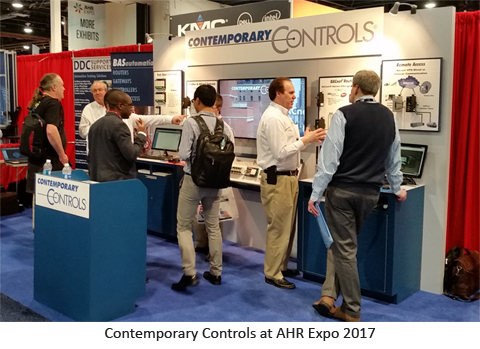 February 2017 - AHR Expo reports that with over 68,000 attendees and more than 500,000 square feet of exhibits, the 2017 AHR Expo was the largest ever held. Based on how busy we were at our booth, we believe it. We're especially pleased with the genuine interest in our open, Sedona-programmable BACnet controllers. Customers who were already familiar with Niagara Framework™, were excited to see a controller which leveraged the drag and drop component-based programming of Sedona Framework™ along with our unrestricted programming tool — the free Sedona Application Editor. For customers who aren’t familiar with Niagara, we are creating a host of educational materials about Sedona programming. With these resources available, users can take full advantage of the open control technology designed to assist system integrators in quickly implementing networked building automation programs. "The BAScontrol Series has been very popular with our customers who are looking for a controller which supports BACnet for open communication and Sedona Framework for open programming via an Ethernet connection," said Zach Netsov, Product Specialist. "The new controllers we added to the series share the same common core of features and differ only by I/O count or network connections." The new BAScontrol22S is a BACnet/IP or BACnet MS/TP, Sedona-programable Unitary controller. It is perfectly suited for indoor or outdoor applications due to its rugged metal design, low profile, and wide temperature operation. All controllers in the BAScontrol series comply with Contemporary Controls' vision of a truly open controller – open communication in BACnet, open programming in Sedona, free programming tool without restrictions - SAE. In addition to the BAScontrol series, our popular BASgatewayLX, a Modbus to BACnet/IP gateway, received a lot of attention. Modbus remains a popular network interface. It is commonly found in applications such as boiler control, variable speed drives, and metering applications, but these devices lack BACnet compliance. To make Modbus devices appear as individual “network viewable” BACnet devices, a BASgatewayLX is the solution. With over 100 device profiles for different equipment manufacturers already available, the ability to create custom ones, and our free service of creating Modbus profiles for your specific device, we basically do the integration for you. And of course, our BASrouter is always a fan favorite. It’s one of the most cost-effective and reliable multi-network routers on the market. The compact, durable, and proven BASrouter provides stand-alone routing between BACnet networks such as BACnet/IP, BACnet Ethernet, and BACnet MS/TP — thereby allowing the system integrator to mix BACnet network technologies within a single BACnet internetwork. Next year, AHR Expo will be in Chicago, which is our kind of town. We can’t promise the warm weather we enjoyed in Las Vegas, but we can promise a warm welcome. See you in Chicago!